1. Support a new animal charity. You probably volunteer and send money to the same charities year after year. But new ones pop up all the time, and plenty exist out there that you’ve never even heard of—and even small individual donations can be a huge help. Spend a morning researching options and see what you find. Perhaps there’s a nonprofit in your community or a neighboring one you didn’t know about before. Or perhaps it’s a national or international charity that works hard on the causes close to your heart. So in addition to the ones you already support, choose one new favorite and map out easy and simple ways you can help out this year. By the way, do you know about my favorite charity, nearest and dearest to my heart, the Shelter Animal Reiki Association? Do you use affirmations in your life? I didn’t used to, but I swear by them now. In my life, I have seen that affirmations really open doors. When I am stuck in a place, I just start with affirmations, and it may take some time, but I always see that as soon as I begin to work with the affirmations, I start to visualize and see what the affirmations are saying, and as soon as I can visualize and see a potential for something, then I can start to feel it emotionally. Then it becomes easier for it to actually manifest on a physical plane. Step 1: Be present and mindful. Any time you are working with or spending time with an animal, remember to be present in the moment and mindful of your thoughts. If your thoughts are negative, how can you possibly create a positive space for the animals? The answer is: You can’t. Animals are sensitive to our thoughts, feelings and energy—whether positive or negative. That’s why it’s so important to think positive when working with animals. If you’re actively doing affirmations, you’re going to see a shift in the animals that come to you. More animals will come. More animals will be drawn. Step 2: Take notice whenever negative thoughts pop up. Situation: A sick-looking dog is dying. Result: Our negative thinking has gotten in the way of helping the animal. We were so focused on what they looked like, or our take on the direness of a situation, that we neglected to truly be there in the moment for the animal, offering a peaceful space. Instead, the time shared between you and the animal has been tarnished by negativity. Step 3: Retrain your mind to think positive. Result: The animal is not stressed out by our negative energy, but rather drawn to our open heart and mind. A positive space has been created. Step 4: Practice, practice, practice. Emotions are tricky things, and they often have minds of their own, refusing to listen to us. So be easy on yourself if this is all new to you. Learning to think in affirmations requires time, patience, practice and self-compassion. If sad or negative thoughts feel standard and familiar to you, it’s going to take extra effort to retrain your mind to think positively. But it can be done, even if it feels a little weird at first, or like you’re making it up. But keep trying—eventually the energy within you will shift, and that’s when you’ll know your hard work has paid off. You’ll feel less stress and anxiety within your heart, and the animals around you will feel that, too. What are your favorite affirmations? Adapted from How to Help Animals With Reiki by Kathleen Prasad. We all want to provide a happy life for our animals—after all, they’re special members of our family. A good start is to provide clean water, healthy food, a warm bed, toys and socialization. But are you feeding and nurturing their hearts and spirits? Are you harnessing the joyous power of now? Even more important than the basics to ensure your animal’s happiness is to develop a relationship based on mutual trust, respect and shared peaceful presence, which is something animals are great at teaching. Watch what your animal is telling you by his behaviors; listen to your heart to help you savor moments when your animal is truly blissful; and meditate with your animal to help you connect more deeply and strengthen your bond with each other. Your animal will respond in amazing, contented ways to your new mindful attitude. In turn, the happier your animal is, the more joy will radiate in your own life! 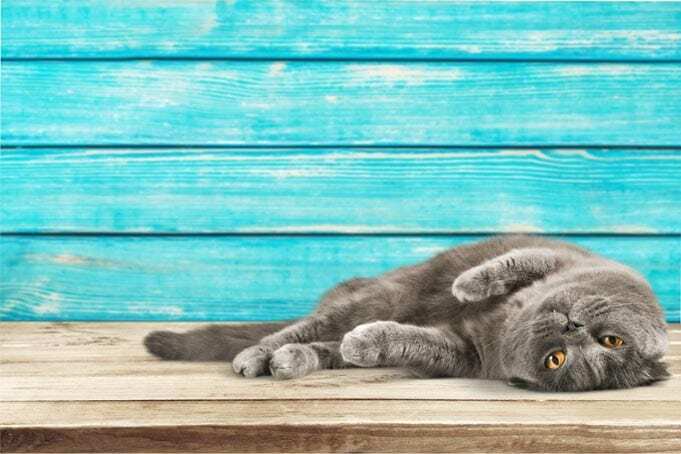 Read on for the top signs your cat, dog, horse, lizard, bird or bunny truly is happy. 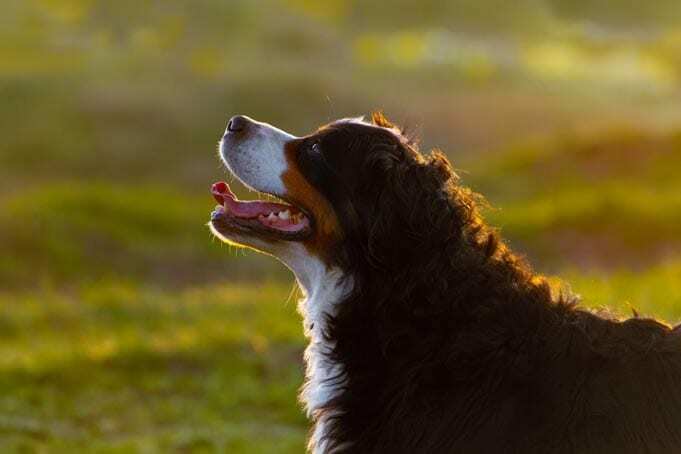 Taking time each day to stop, open your heart and share mindful, meditative moments with him will increase these behaviors and ensure a happy animal. 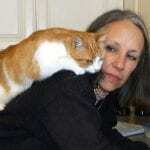 I’ve written many sample meditations you can share with your animal to bring peace and contentment. Lies on his back with tummy exposed, and rests with paws tucked. Nudges you with the crown of her head or her nose, or rubs her body against your legs. Is welcoming when they see you. Does “the long blink” when you look at them across the room. Kneads biscuits on you when you cuddle them. Shows interest in what’s going on around her and the environment. Stands or sits with a playful or relaxed body posture. Spends most of the day exploring, playing with toys, walking around and doing things. Shows enthusiasm for their favorite things: snacks, walks, when you return home, etc. Is relaxed with floppy ears. Walks with a spring in his step. Holds his head up and looks around. Enjoys horse toys and companionship. Eats well and has a full tummy. Lives in a clean environment. Goes willingly to you (a sign of trust). Has space to climb and a large enclosure. Likes new sights and smells. Consider taking your iguana for a walk outside on a leash. Has some free time to roam your house. Grinds his beak deep in the night when sleeping. 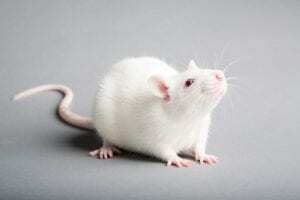 Has happy vocalizations: singing, soft chattering, talking, whistling. Purrs, especially when paired with a relaxed body stance and fluffed feathers. Preens her feathers (and tries to preen you). Perches on a single foot. Regurgitates her food for you (you’re welcome). Wags his tail, much like a dog. Is alert and uses her assortment of toys, chews, perches, mirrors (assuming she likes mirrors). Rolls on her side and relaxes with her eyes closed. Lies down with his head flat on the ground (an invitation for pets). Grooms herself to stay clean and shiny. Shows off with “binkies”—meaning, he runs and jumps and twists mid-air. Although the above warning signs may on the surface seem obvious, sometimes in our busy lives, although we may be taking care of the basics with our animals, we often forget to stop and check in with the deeper levels of feelings our animals may be having. Sometimes we are just too busy to just be with our animals. Learning to slow down and spend time sharing the present moment with the animals we love can transform the ordinary into the extraordinary—each and every day! How do your animals respond when you slow down and remember to savor the moment with them? Many times when we learn Reiki for animals, we think we’re going to be “doing” the healing for the animals. But the animals know better. They understand that in a true and deep healing space, where hearts connect in compassion, the healing goes both ways. This healing is not about curing, but about becoming whole. Johnnie is one cat who taught me these lessons. 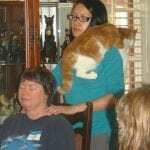 Johnnie (above left) was a beautiful orange tabby who lived at BrightHaven holistic animal sanctuary and hospice. He suffered from a variety of ailments, including renal problems, heart issues, severe dental disease, low potassium and hyperesthesia. Somehow, though, he always thought of others—never himself. For many years of his life, he would adopt certain cats who came to live at BrightHaven who needed extra love. 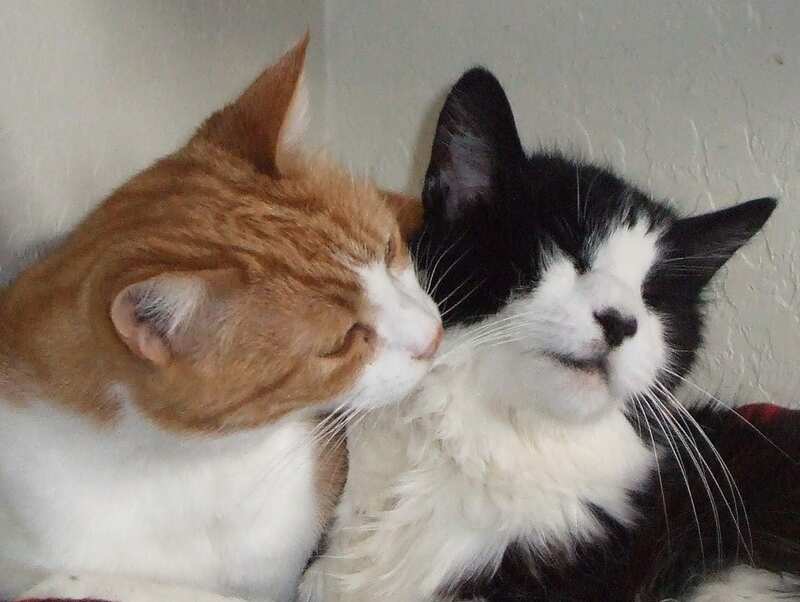 At first, many of these cats were not convinced that they needed Johnnie’s rapt and loving attention, but his engaging personality always managed to persuade each one that a love affair was needed—and, indeed, each one thrived under his doting care. Johnnie and Fray, who works at BrightHaven. As BrightHaven is a hospice, and the animals there are in the final chapter of their journeys, one by one he had to say goodbye to each cat he loved so much. He sat vigil and supported each one’s death with a pure and open heart. When his last love, Vancouver, passed away, it seemed that finally Johnnie’s own heart was broken. It was only after Vancouver passed that we began to see Johnnie front and center for all Reiki classes. At this time, his physical heart and kidneys were failing, and although he certainly benefited from the Reiki shared, his focus remained, as always, on others. As a witness to many of these heartful interactions with my students, I could see that the healing went both ways; that both Johnnie and each person received exactly what they needed. This is a beautiful quality of healing connection that Reiki creates. In time, I had my own health challenge, and during my first visit back to BrightHaven after my surgery for breast cancer, Johnnie came running to me, jumped into my lap and stretched his entire body over my shoulder and draped across my chest, purring loudly. As I closed my eyes and relaxed into a Reiki meditation, I felt so much gratitude for this wonderful feline Reiki teacher and how he shared himself so unselfishly. He and I could let go of our health issues and just “be” together in that beautiful, peaceful Reiki space. I could feel a lessening in my own post-surgical pain and discomfort and could also sense his breathing become more relaxed and regular. 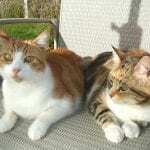 Johnnie passed away after a long journey with his myriad of health issues, but Reiki helped him to reconnect with his healing purpose even after his beloved cats had crossed. Reiki gave him physical and emotional comfort in his final months of life. He also had a beautifully peaceful passing supported by Reiki and surrounded by loved ones, which was only fitting, as he had sat vigil in hospice for others so many times. Johnnie taught me that real healing is not about curing this or that problem. We can be truly healed, or made whole, even when we struggle with physical or emotional issues. When we let go of the need to “cure” this or that problem, we are better able to connect to others from the heart with selfless compassion. In doing so, we create a space where all healing potential exists—and we remember what Johnnie always knew: that this is why we are here in the first place—to help each other remember wholeness. 1. When you get some great news, the first “person” you want to tell is your dog. 2. When you snuggle up on the couch to binge-watch Downton Abbey, the warm body next to you has furry legs and paws. 3. That secret ingredient in your amazing coconut-vanilla cupcakes (and all of your cooking, really) is 1 dog hair. 4. 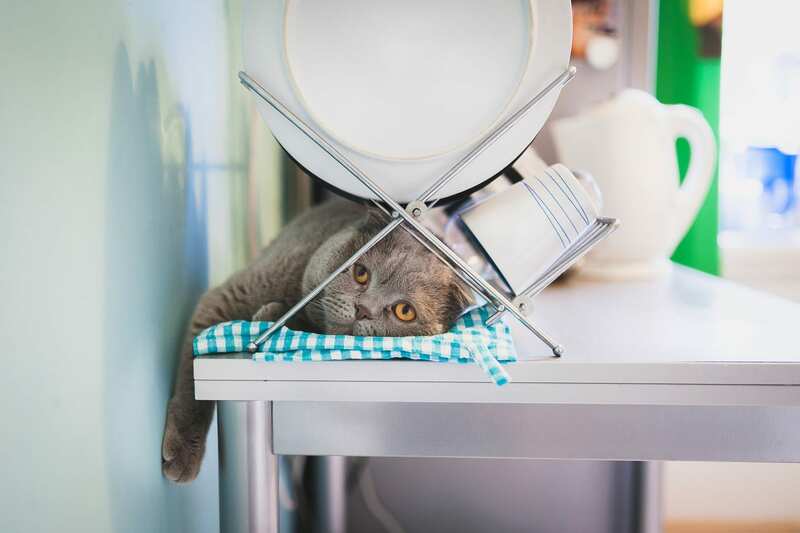 When your cat starts to cough up a hairball (again), you’re at the ready with a towel or paper bag to catch the mess before it hits the floor. 5. When holiday shopping, you can easily spend 30 minutes deciding whether she’d rather have the pink or red heart-shaped chew toy. 6. “Vacation! 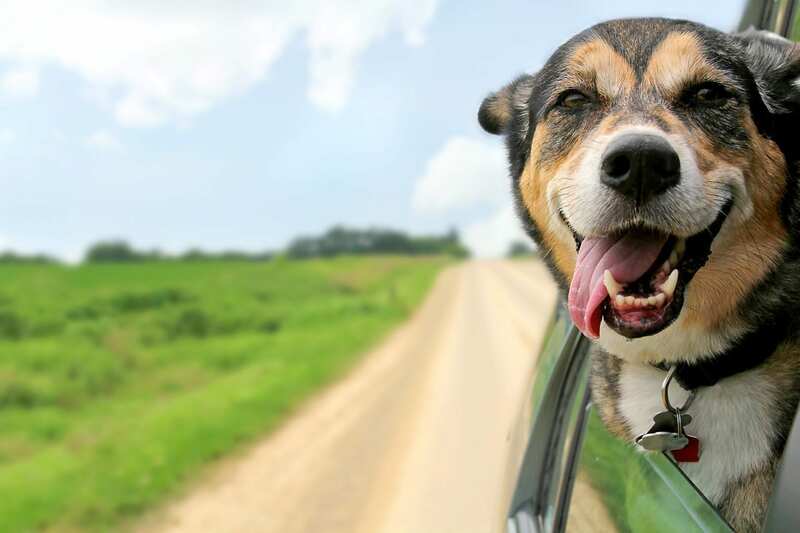 !” means hitting the road for some fun in the sun at your favorite pet-friendly hotels, beaches and restaurants. 7. When the person next to you on your flight to New York brings a ferret on board as an “Emotional Support Animal,” you don’t bat an eyelash. 8. You actually think rat tails are cute. Fact: Rat tails are cute. 10. 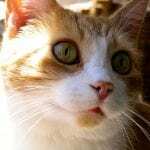 “Deathly afraid of needles” quickly turns into “superstar subcutaneous fluids-giver” when your cat becomes diagnosed with kidney failure. 11. When your best friend talks about her new shoes, you immediately think of your horse’s shoeing appointment you forgot to schedule. 12. The first thing you see in the morning when you wake up is your cat’s stomach laying across your face. 13. Your favorite smells are puppy breath and fresh manure at the barn. 14. When you find a spider in your apartment, you summon all your bravery and find a glass (or wide-mouthed jar, depending the size) to safely put it outside. 15. Your dog knows how to eat off a fork. What about you? (Guilty as charged?) When did you know you were a delightfully unapologetic animal person?